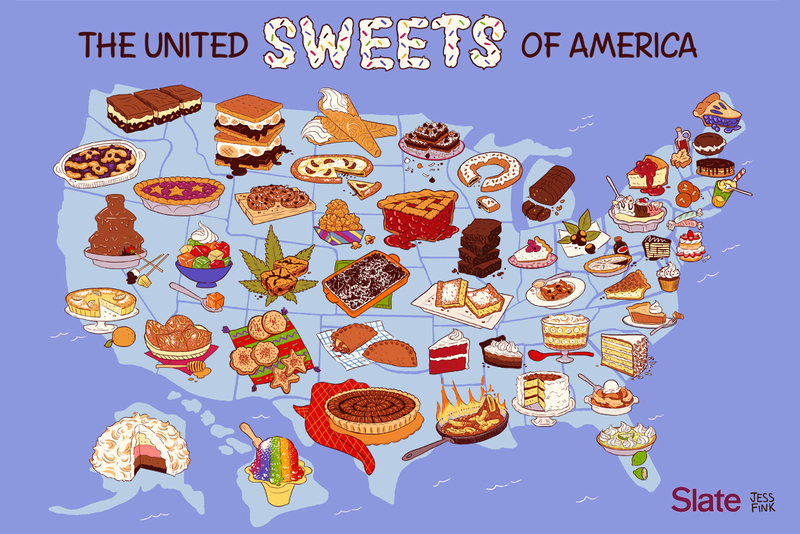 Teaching Spotlight: Maps of American Food – Kera Lovell, Ph.D.
I’m in the throes of organizing a course for the American Studies program at Purdue on food studies – a class exploring the connections between food, identity, and place. Today’s visual inspirations are maps I’ve found trying to embed certain recipes within US regions and cities. What could you add to these maps? How would your map of US food culture differ? For me, these are missing a fundamental food from my youth: pecans. I was raised in Leesburg, Georgia – a city with mostly suburbs that were rapidly created after nearby Albany was integrated to meet the demands of white flight in the 1960s. My family moved there after our home (and thousands of others) were flooded during Tropical Storm Alberto in 1994, fueling new housing development in the largely rural Leesburg. When we moved to Leesburg, our middle-of-nowhere suburb was surrounded by pecan orchards. Miles and miles of pecan trees about 20 feet tall, in rigidly aligned rows as far as you could see. But this landscape changed in the 10 years I lived there from about 1995 to 2005. Food culture shifted – nuts became more expensive and too caloric and fatty for mid-1990s diet fads. The price of land spiked – the push for new housing developments made pecan orchards prime candidates for new suburbs. When I left for college, few pecan farms remained. Identical houses were built equidistant every 3-4 trees. “Who would want to live in such a maniacal grid?” I thought from our largely wooded suburb (woods that would be demolished to build more houses in the coming decades). Needless to say, I would add pecans and walnuts to Georgia on my map. When I was young, I could find them raw in snack bowls on my grandma’s dinner table, sprinkled atop the sweet potato souffle on Thanksgiving, and forming the crunchy crust of a pecan pie…not to mention, right outside the kitchen window. Love it! I would so take your class! I have grown to love pecans myself. We get a batch of homegrown pecans every year.